In the 1980s, robot systems increasingly took over the work of machine operators. And because a robot could do the same thing over and over again and for long periods, companies could spend a great deal of money to get the robot to do that job. Today, the situation is precisely the opposite. Production processes are fully adapted to the changing needs of the target group. At Cellro, this was the starting point from the very beginning. 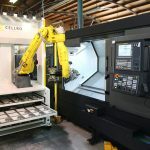 The goal was to be able to design a robot that was largely the same for many different production companies in the machining industry, but that could be fully tailored to the customer’s production process. That it is largely the same means the development costs are distributed over all the purchasers of the robot. As a result, the acquisition cost of a robot is much lower, making this type of automation an attractive proposition for smaller production companies, which often make different products. This also offers advantages in terms of assembly and service. Standardised automation makes it possible, for example, to have spare parts in stock so that customers can be helped more quickly in the event of a malfunction. To be able to approach a certain target group in a certain “sweet spot”, Cellro has made a number of standardisation choices. To begin with, we have made a choice in the type of machines we can operate with our robots. On the production side, we want to serve customers that work with a range of small and medium-sized batches of CNC-machined parts (often made of metal). We then looked at how we could group different customers together on the basis of the product sizes and batch volumes. The outcome is our current product portfolio of robots. The next stage was a rationalisation regarding the different types of products made by manufacturers. One manufacturer wants to have it processed longer, the other for not as long. Yet another wants to have it processed on two sides, or even have some storage for small parts. It is clear, then, that major differences can also arise here. This is why there are differences within Xcelerate modules to meet those different needs. If a customer primarily deals in small products, a four-drawer module is suitable. If the customer works with larger products, fewer drawers or carts are a better solution. These modules are not developed separately but together; with Cellro’s advice, you determine what the best standardised modules are. These can then be added to the standard configuration. Xcelerate allows us to serve a very large segment of the market. Of course, if Xcelerate does not fit into the production process, a tailor-made solution can always be provided. Another product from the Cellro portfolio may also be suitable. Standardisation also provides a number of advantages. The service technicians know precisely how Xcelerate works and where everything is. Parts are usually in stock, and the module can be further expanded and modified. Do you want to load new products if you have been working on automation for some time? Thanks to our experience in automating many machining tools, Xcelerate software offers a range of possibilities. 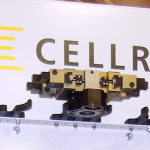 Xcelerate’s robot cell can accommodate many different configurations without a programmer having to intervene. What is the most suitable configuration for your Xcelerate? The first choice to be made is whether Xcelerate X20 or Xcelerate X10 fits best into your production process. That depends in particular on the weight of the products. (Do you wish to find out more about this? If so, read our blog about the models.) From this point on, you have a basic cell to which modules must be added. You can choose from a different number of drawers, depending on your product height. You can also purchase carts if you occasionally have larger products to be loaded. Next, we examine which grippers are needed to pick up the products. Finally, we examine the safety features provided by Xcelerate. Which features should you add to ensure your production process is safe? With this configuration, it is possible to have Xcelerate work together with a machine. Often, we go a step further with the customer and see that the production process or the product forms fall outside the “sweet spot” on the whole. In that case, a tailor-made solution is provided based on the standard configuration possibilities. This means that together with you, we look at how Xcelerate can continue to load those exceptional products. Thanks to our experience in automating many machining shops, Xcelerate software is able to cover a range of possibilities. As a result, many options are available with the customer’s robot cell without a programmer having to intervene. The production process of an Xcelerate user can also vary a great deal. For example, if we see that customers like to deliver products with carts or Euro-pallets, we look for a solution that suits them – all within the parameters provided by a standard Xcelerate. Would you like to find out more? Are you curious to know how Xcelerate can help you in your production process? If so, contact one of our experts today. Previous post What impact will robot automation have on my business? Next post Can I use a loading robot with my machine? Can I use a loading robot with my machine? 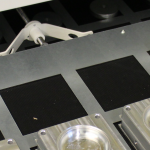 What are the advantages of the drawers and inlays for Xcelerate users? 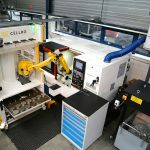 What are the advantages of the robot grippers and fingers for Xcelerate users?